Hotel La Scaletta, BW Signature Collection is situated in the heart of Florence, just a short walk from the famous Palazzo Vecchio. Guest rooms are designed with elegant style with comfort, each boasting a unique character. Common to all rooms are conveniences such as flat-screen TVs, minibars and free Wi-Fi. 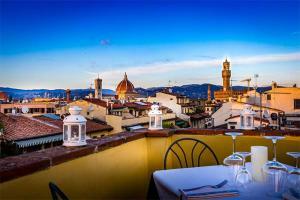 During the summer, enjoy a meal on the terrace at Panorama Restaurant, and enjoy picturesque views of Florence. Peretola Airport is about 4 miles from the hotel. Palazzo Vecchio is a short walk away.